Puttings aside for now morality of characters, I would like to talk about similarities and difference between Satine Kryze and Pre Vizsla and how they could be seen by New Mandalorian society at the climax of their respective arcs. First thing though, I want to clarify something: as much as TCW may never outright said anything about Dral'Han (Annihilation) / Mandalorian Excision that happened ~700 years prior to Clone Wars era, this event played a major role in shaping current mandalorian society - or more precisely: two societies: the pacifist and warlike. The Republic occupation and influence still held power over Mandalore, to the point that when Duchess cemented neutrality for her people, soon after that trade routes were closed around Mandalore system - even though the war did not come there yet(?) - what was mentioned in “Corruption” [s03e05]: “Desperate times on Mandalore! Having won neutrality for the Mandalorian system, Duchess Satine now finds herself an outsider with little aid to her people. Supplies are impossible to come by, except on the black market. As a result, the Duchess faces a world consumed by greed.” So, TCW may not discuss in direct way how Republic screwed up Mandalore in the past nor how it mixed into matters of “independent” government now, but it doesn’t make Republic occupation and its effect on characters any less real. Saying that, there is the first detail about Satine and Pre I want to talk: political & social position. The Legends Mandalorian had visible social groups including: Mandalore(s), veterans, warriors, blacksmiths, farmers [and in the case of ancient Taungs, shamans], yet the division between “classes” was not rigid. Mandalorian could be both farmer and great warrior. The title Mandalore was reserved for the best, most skilled, most charismatic and/or the most supported by society person. The status of Mandalorian was either given by birth or by adoption, person could be disavow and/or became dar’manda (no longer Mandalorian) and reclaim the right to mandalorian culture later. People could belong to one of the oldest clans (Vizsla, Ordo, Fett) or be not associated with any family and there wasn’t social class difference between them because all have the same rights (f.e. challenging Mandalore/leader if they did not agree with their decisions) & duties (Resol’nare). In reality, how great of Mandalorian someone was never depended on birth rights or personal connection, but what kind of person he/she/them are. In other words, Legends Mandalorian did not have aristocracy similar to the ones of Core Worlds (as in: the highest class in society, especially those holding hereditary titles or offices). There is of course Prime Minister (that according to “The Academy” episode is one of “two people in charge” of Mandalore albeit I’m not sure if we saw Almec making any important political decision without Duchess’ contest - beside the whole illegal business & coup, of course and ignoring Satine’s angry rant about corruption) and mentioned Ruling Council to support Duchess with their advices. Unfortunately, during the Clone Wars, there is little use of Council due to corruption, apathy and bickering between Ministers / leaders of Mandalore. The only real decision / action that Ruling Council did worth to mention was asking Obi-Wan Kenobi (Republic) to provide protection for Duchess during “Voyage of Temptation”. The Death Watch Manifesto (from Bounty Hunter Code ) - a pro-DW propaganda source, mind you - claims that Mandalorian clans became divided after Mandalorian Excision to the point that even the oldest clans had their members on both sides of cultural conflict. That concerns Kryze family as well Vizsla clan. The politically / culturally conflict overlaps with clan rivalry that has been going on for a long time. In short, the situation of Mandalorians is complicated and far from reconciliation, even in the face of threat from the Republic & Jedi. According to TCW Character Encyclopedia, Satine was born on Kalevala, a planet known for expensive wines, ships and rich cloth and so far a place the most related to New Mandalorian’s nobility. We may only guess if the union (possible marriage) between warlord and Satine’s mother was a political move to connect two influential and wealthy clans or was that dictated by purely romantic motives. Nevertheless, only Satine’s father is described as mighty mandalorian warrior - and that rises some questions. We aren’t told why he sent his child offword… or what offword we are talking here, really. Satine’s homeworld was Kalevala, but she was on Mandalore while being protected by Jedi, does that means her father sent her there? Was he somehow forced to do so? And if yes, by whom? Satine’s mother? Republic? Other mandalorian warlords who wanted more power for themselves? 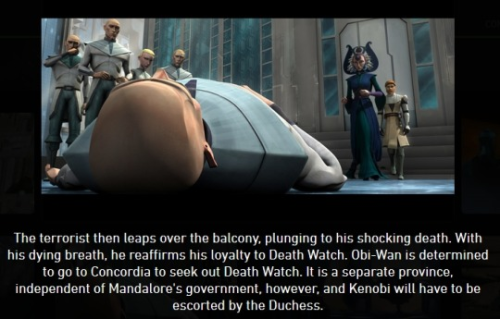 And if Satine’s father, as one of Faithful Mandalorian maybe, wanted independence for Mandalore system - thus became a threat to Republic - Jedi arrival on Mandalore to protect (take away) Satine may not be motivated by her own safety but to secure A) the submission of the current ruler (with daughter as “hostage” in Game of Thrones style, similar to how Eddard Stark took young Theon Greyjoy as his ward) and B) loyalty of the successor to the throne. I know that sound awful but to be fair, Jedi rarely integrate into internal government matters if there is no profit for the Republic. An extended mission when i was younger. Master Qui-Gon and I spent a year on Mandalore protecting the Duchess from insurgents who had threatened her world. They sent Bounty Hunters after us. We were always on the run, living hand-to-mouth, never sure what the next day would bring [...] A civil war killed most of Satine's people, hence her aversion to violence. When she returned, she took rebuilding her world alone. Satine was born on Kalevala, so…by “her world” does Obi-Wan meant a whole Mandalore system or Kalevala or Mandalore on which they were at that time? Also, since BHC confirmed that there was Civil War in which Faithful warriors (DW) wanted to take control over Mandalore, I don’t really understand why insurgents - the warriors - would hire bounty hunters? I mean, I know they were outnumbered and all, but frankly, we aren’t even told if the bounty hunters were to kill Satine or just to take her away from Jedi (the oppressors). Nevertheless, we learn that Civil War killed most of Satine's people - what once again is pretty ambiguous, because did Obi-Wan mean Satine’s family and/or people from homeworld or did he mean Mandalorians as a whole? Because if the letter, that presents Satine as a hereditary ruler. Especially with the line “When she returned, she took rebuilding her world alone”. BHC mentioned that her father died during Civil War and if she was the oldest child, should inherit the throne. Since there is no info if she needed to fight for the title of Duchess of Mandalore (she returned and started rebuilding her world without asking anyone about opinion apparently), for me it seems Satine was born not only in aristocratic (wealthy) family but was designed to rule Mandalore sometime in future. Frankly, the same can be said for her nephew, Korkie, who is already in Royal Academy that is to educate future government leaders. We may not know much about Satine Kryze’s past, but The Clone Wars animated series and tie-in sources present her as wealthy nobility with royal-like power over Mandalore (and maybe Kalevala). She wears rich clothes that emphasize her high status, has own palace with Throne Room and uses luxury spaceliner. She is the person that made decision to turn New Mandalorians into extreme(?) pacifists due to her personal childhood trauma & aversion to violence. Maybe it’s just me, but I can’t see her as someone who could be democratically elected leader. In short, Satine Kryze had a high social rank and political position for majority of TCW storyline. Pre Vizsla’s history is no less covered by mystery. Satine have seen Pre as a close ally and maybe even a friend, who the same as her choose pacifistic ideology over violent past. Who was supposed to help her hunt down the remnants of Death Watch / the opposition of her reign. We know it never was a case. In other words, Pre as governor of Concordia was NOT under the authority of the Duchess. What makes them more or less equal on political ground. BUT! TCW Character Encyclopedia and Visual Guide: New Battlefronts both stated that Pre was born on Mandalore. Which raises a question, how he ended as a leader of independent from Mandalore province? Duchess Satine couldn’t nominate him as her representative nor force Concordian people to vote for / accept Pre, could she? I’m not be specialist of such matters, but shouldn’t governor actually have a citizenship to be even elected to office? Of course, Pre may simple moved to Concordia at some point, but frankly, wouldn’t be that a bit suspicious? Almec said once “All of our warriors were exiled to our moon, Concordia. They died out years ago” and with that statement it’s easy to imagine that from the perspective of the pacifist society, the Mandalore’s Moon is marked as a bad place (natural prison and/or graveyard full of angry, bitter “barbarians”) and with Pre’s family connection to Tor & Death Watch, I think a sudden desire to move there could arouse unwanted interest in him and thus undermine the whole infiltration mission. BHC too mentioned that “some of [DW] warriors were exiled to the moon Concordia”. Some slipped away, but I don’t think that happened to Pre, per se. Basing on Legends sources, Mandalore Civil War started in the same year as Battle of Galidraan (44 BBY). From my calculation it seems Obi-Wan would be 13 years old at that time. There is no information about age of Satine & Pre, but we know Duchess couldn’t be that older than Kenobi. Similar, Pre as the successor of Tor most likely is around the same age as Satine & Obi-Wan. Maybe a bit older, maybe a bit younger, but enough close to be seen as ‘innocent” in the conflict. If young Pre took part in the fight and were imprisoned, it’s easy to blame Vizsla clan for forcing a child into war zone. If Pre was exiled on Concordia, he could pass later as converted man who after years understood the error of his youth & madness of Death Watch’s ideology. If Pre did not participate in war (due to young age), but his family did and get caught, he most likely was exiled to Concordia with them. Because what else New Mandalorians could do in such situation? Keep a child from parents (clan) and try reeducated him into pacifist society? Put in orphanage for difficult youth? How many of other kids could be in similar situation? How much more Death Watch / exiled warriors would fight harder to get back their children, to tear them out of New Mandalorian hands? The society under Satine’s new rule may not mean any harm to the children forcibly taken away from their family, but if there is one thing that mandalorian warriors hate, really hate, is when someone dare to threaten their kids. This is like asking for absolute war like nothing else. The “tragic story” most likely include things that Satine can relate to, like childhood trauma, growing up in dangerous times (uncertainty of tomorrow), the loss of family & the pressure to rebuild things anew. The similar experiences of how senseless violence destroyed life, how much one suffered because of war for sure could bring Satine & Pre closer to each other. Or more precisely: makes Satine to trust a “converted man” like Pre Vizsla whose ambition was to clean the name of his clan - just not in the way Satine’s imagined. There is also one more aspect to think about exiled Mandalorians. If only warriors were sent there, I think Satine’s government could have worse relationship with Concordia. The anger at taking away their children would last for long. But if after Civil War the population sent there also included children (and disabled and elderly people), for their own sake alone some family members would be forced to change their lifestyle. After all, children need to be fed, provide with medical care, access to education and safety to grown up. Maybe at some point exiled people managed to either build their own city and establish commercial and political relations with Mandalore or get involved with indigenous people (farmers and miners?) and adopted to their (less violent) customs. Of course, this is just one of possible explanations. We aren’t told how and when Satine met Pre or why she had him in so high esteem for so long - beside that he was helping her in catching remnants of Death Watch (the opposition of her rule). We only know that both were leaders of their respectively governments that worked independently, albeit thanks to their (supposed) friendship, Mandalore and Concordia seemed to cooperate with each other over the years. At the same time, only Satine holds aristocratic title and most likely inherited the right to rule of Mandalore either from father or mother; what may explain why Jedi were sent to protect her in the first place. While according to TCW Visual Guide: New Battlefronts, Pre somehow earned his position. Backing to the main topic, Satine and Pre both have high position in Mandalorian society. Both are burdened with responsibilities for their people (and ideology). The main difference is that, Pre most likely was forced to earn his leader position - the political and in Death Watch while Satine presumably was meant from the birth to be either ruler of Mandalore (or Kalevala) or one of its influential leaders (similar like Korkie is destined to grow up as one of future leaders by Royal Academy teaching program). The other more visible difference is that Duchess’ politics affect hundreds of worlds that also want to remain neutral in current military conflict while Pre’s political activities are focused primarily on internal affairs of Mandalore system (“hunting down Satine’s opposition / DW”, bringing Mandalorian back to their warrior roots). Also, I dare to say Satine’s political position was more certain due to having powerful allies & friends in Republic Senate (Padme Amidala, most likely Bail Organa) and Jedi Order (Obi-Wan Kenobi who actually is one of Council members), while the current leader of Death Watch by long time couldn’t openly act, and later his cooperation with Dooku/Separatist turned out to be one big fiasco. And yet, the more time passed, Satine’s political & social position was undermined by widespread corruption on Mandalore while society’s perception of Pre and his Death Watch changed at the same time.